Chancellor, Vice-Chancellor, honoured guests and graduands, it gives me great pleasure to be presenting today Daniel Hanson, for the award of Honorary Master of the University. Daniel is a professional designer and manufacturer of high end clothing and textiles. In 1989 he established his company ‘Daniel Hanson’ in Nottingham which is now an international brand with a reputation for producing the best nightwear in the world. His company has been described by the Independent as “the Sistine Chapel ceiling of dressing gown luxury”. Daniel designs and manufactures collections for some of the most prestigious retailers and top level fashion brands in the western hemisphere, but still retains a UK manufacturing base in Nottingham. Daniel left home at the age of 15 with little clue about what he wanted to do. He worked in a variety of clothing stores between the ages of 15 and 18 and found a lucrative and enjoyable side line, altering clothes. Inspired by the world of fashion, Daniel returned to education to study fashion design. He was given a place, without having the prerequisite qualifications, at the Derby College of Art and Technology. 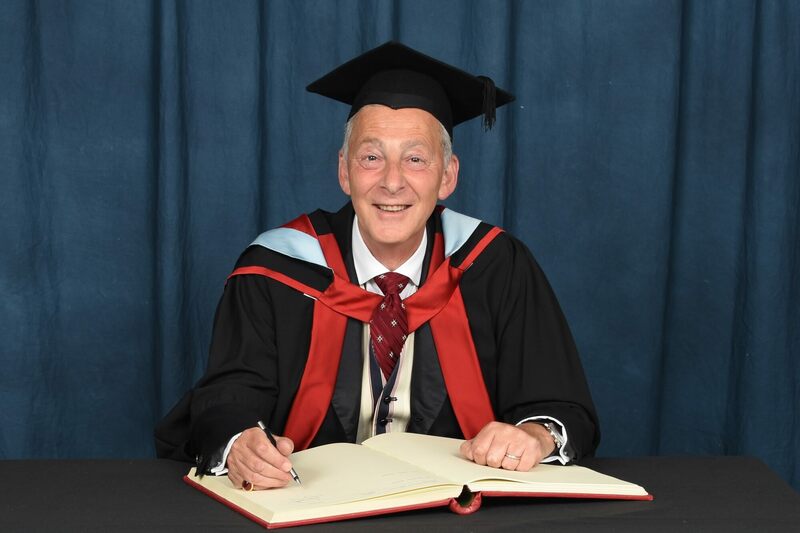 This was followed by a 12 month sabbatical as the Student Union President at the Kedleston Road site for the year of the merger during which all sites became Derby Lonsdale College of Higher Education, a precursor of this University. Daniel has said of his time here: “I can honestly say that I still use skills acquired during my period at College, every day of my life as a practicing designer. Furthermore some of my closest friends, (students and tutors) many of whom I am still in touch with and are here today, were made during that period of my life.” We’re very proud to count Daniel as one of our alumni. Daniel completed his studies and got a job running a design department in a jeans and sportswear department. This was in the early 80s and he found himself designing pockets for 40” bottom jeans. Daniel’s career took off and in 1984 he was nominated for Designer of the Year by the British Fashion Council. He worked in London as a non-automotive design director for Jaguar car company and in Paris with the International Wool Secretariat. He also had periods of lecturing part-time in the furniture department at The Royal College of Art, before taking up the position of Principal Lecturer and Course Leader in Fashion Design at Nottingham Trent University in 1989. But before very long, Daniel realised that the satisfaction he gained from the practical, manufacturing side of the design industry was too great to abandon and the company ‘Daniel Hanson’ was born. His first account was with Harrods, then came a large order from Neiman Marcus in the US, and so the brand quickly began to establish itself as the height of luxury for high profile personalities around the world. Through his retail outlets Daniel has received commissions from huge names, including Sean Connery, Meg Ryan, Hilary Clinton, Brad Pitt, Ozzy Osbourne, Victoria Beckham, Pierce Brosnan, Bianca Jagger, Prince William and Elton John. The list goes on and on. His work has been used in a number of films including Entrapment with Sean Connery and Catherine Zeta Jones, and 47 Ronin with Keanu Reeves which involved 265 outfits and 966 of Daniel’s pieces including the garments for the Tengu Monks and the Hari Kiri scenes. It was a career highlight for Daniel when he heard Catherine Zeta Jones had been fighting with the wardrobe mistress to keep one of Daniel’s garments after shooting Entrapment. It is clear that Daniel’s success has come from being highly driven. He strongly believes that it doesn’t matter what you do in life, the most important thing is to make sure you’re good at it. If you are going to be a teacher, be a great teacher, if you are going to make dressing gowns, make the very best. Chancellor, in recognition of his contribution to fashion and his international success as a textile designer, we are delighted to award Daniel Hanson the honorary degree of Master of the University.